This tutorial explains how to create an Excel VBA custom Function to find the first colored Cell value in a Range using ColorIndex Property. This custom Function was originally created for a question raised in Microsoft Community. It seems that many people have been asking similar questions like finding the first non-empty Cell, finding the first cell that contains formula, etc, so I am moving my Function to this blog. You are recommended to read my another post before using this custom Function. In the below Function, I use ColorIndex<>xlNone to identify colored Cell. It is important to note that White is deemed as colored, while “No Fill” is not colored. rng is a Range that contains multiple Cells, in which you want to find the first colored Cell. For a selected Range, For Loop loops each Cell from left column to right and then loop the next row, therefore the first cell is defined in this logic. Once you type a formula in Cell, the result cannot be refreshed automatically if you add/remove color to argument Range. Instead of getting the first colored cell value, you can modify a little to get the cell address (such as A1, C10). How would you go about doing this if you wanted the cell’s location/address and not the value? “C2” in the first example. Thank you for this example! it’s what I’ve been looking for. 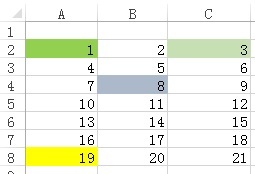 I put the wFirstColorCellAddress code in the VBA, then added the formula to a cell. (=wFirstColorCellAddress(A2:G2)) Is this not correct?